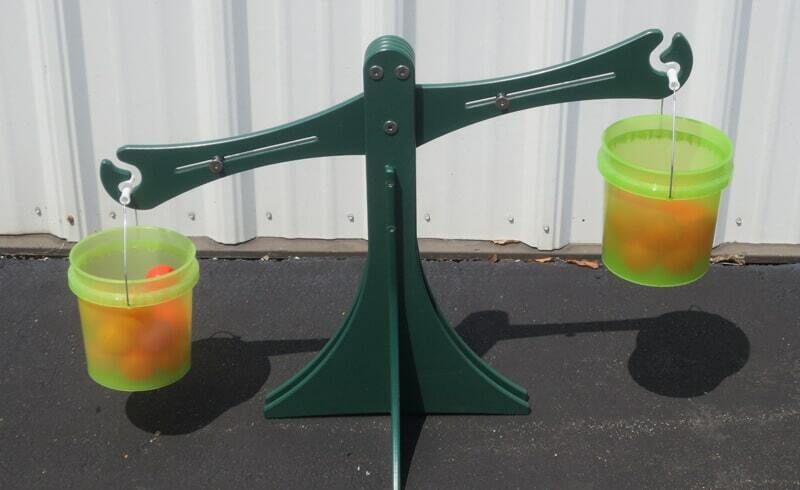 The Balance Scale is a portable, outdoor scale for your natural preschool playground. 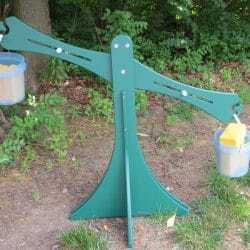 It is a wonderful piece of outdoor learning equipment for teaching about math and science concepts. Add buckets to the Balance Scale and the children can place a manipulative or loose part into each bucket and observe as one side lowers and one side raises, showing them which object weighs more and which object weighs less. Children can also put sets of items into each bucket to compare the weights of several items placed together. Because the Balance Scale is portable, you can move it to whichever location best suits the needs of the children. For example, move the scale next to the sandbox and compare different amounts of sand, move the scale to a gardening area to compare the weight of vegetables, or move the scale to a gravel pit (see, Truck Pit) to compare the weight of rocks. We designed the Balance Scale so it can be adjusted so that it is perfectly balanced before beginning an activity. The Balance Scale is available in a large or small size.